Our recess mounted letterboxes are perfect for flats, apartments and communal properties – as long as you have a hole in the wall to fit the little beauties into! 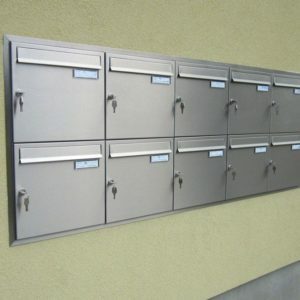 These multiple post boxes are fitted into a cavity in the wall, saving space in small areas – clever thinking. If you don’t have a hole in the wall and don’t think it’s a great idea to start one with a hammer, then do have a look at our Multiple Letter Box page where no demolition is required. 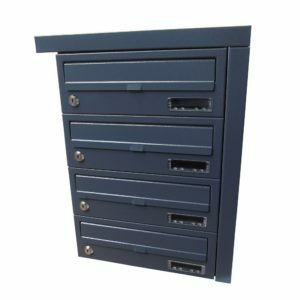 As with all our letterboxes, they are supplied with a Euro-lock and two keys and are manufactured in Europe to ISO 9001 standard. 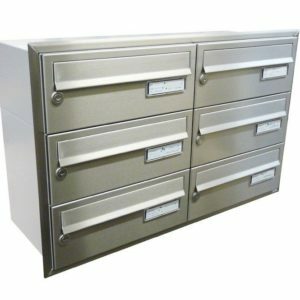 Our recessed mounted post boxes come in galvanised steel-powder or polished stainless steel. Some of our more popular front in and out models are available for delivery next day in the UK. 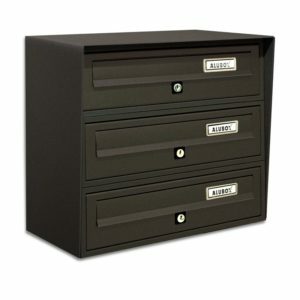 Our E2 in dark grey is one of these. If you want to go totally wild and have a different colour of that model, we can do black, white beige, silver, dark silver or graphite and we can get that in for you with a little notice. Of course, wall trims are made to match. We have a good few years of experience in communal in front / out front post-boxes by now. 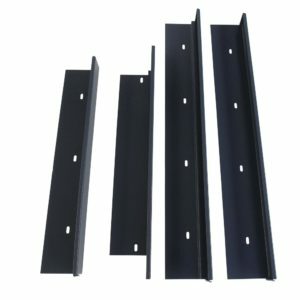 We know that different projects have different needs. Not all holes are created equal! 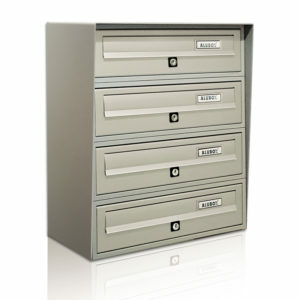 So of course, we can manufacture the ideal post box to your specifications and deliver to site ready for installation. 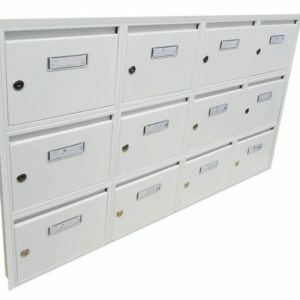 We can even create larger banks of letterboxes for flats by assembling several together in the factory, saving you the hassle of doing it onsite. For a made-to-spec model we have some minimum order amounts and will need a bit more time to get them beautifully made and on to you. 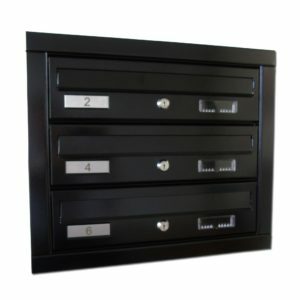 Do browse our models for information and get in touch to talk to us about some lovely bespoke letterboxes to fill your letterboxed-shaped holes.